Run multiple versions of Firefox side by side. Is there a better alternative to MultiFirefox? Is MultiFirefox really the best app in Browsers category? Will MultiFirefox work good on macOS 10.13.4? 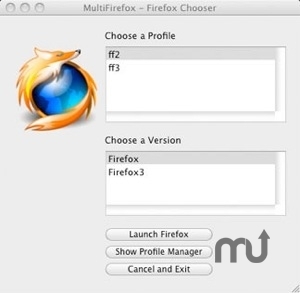 MultiFirefox allows you to launch any version of Firefox along with a matched version profile. Further, this launcher also allows you to run all of these versions of Firefox side-by-side. Used with only one version of Firefox, this is the easiest way to run multiple profiles, and select which one to use when you start Firefox. Profiles contain all history, cache, bookmark, and plugin information, meaning you can start Firefox in numerous different configurations. MultiFirefox needs a rating. Be the first to rate this app and get the discussion started!